To achieve true greatness in your chosen field, I believe you have to be fully committed to the cause. You have to understand every complex facet of your subject matter. You must immerse yourself in its splendour. Robert De Niro, long before he peaked in his role and subsequent reprisal(s) of Jack Byrnes in Meet the Parents, Meet the Fockers and Little Fockers, cut his acting teeth by going to extreme lengths in his quest for performance perfection. De Niro drove a taxi around his native New York City in order to understand the depressed and lonely insomniac Travis Bickle. He gorged on pizzas and burgers to add authentic bulk in his portrayals of Al Capone and Jake LaMotta. He even took to the boxing ring with the latter and reportedly cracked a couple of LaMotta’s ribs, so effective were his method acting techniques. 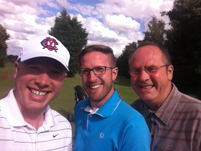 In a bid to emulate Bobby De Niro then, and in the hope that it would lead to the betting equivalent of an Academy Award or Gambling Golden Globe, I went on a golfing weekend. I would learn more about the intricacies of the game from within, I thought. I would appreciate the power needed off the tee and the deftness of touch required around the dancefloors. I would garner greater understanding of the emotions involved in a strut down the 18th fairway protecting a slender lead over my foes. More aptly, I became heavy rough and trees. I felt the sinking feeling of ricocheting off branches into the water protecting a par-three green. I suffered humiliation at the hands of my two brothers and father as I scored fewer than 10 stableford points and shot around 60 over par. I didn’t so much need a set of rescue clubs as I did an entire bag of emergency service irons. 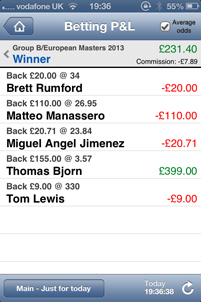 Yet, after Saturday’s round, I came back to the clubhouse, saw Thomas Bjorn was the market-leader in the European Masters, remembered that he had won the event before, and lumped on. 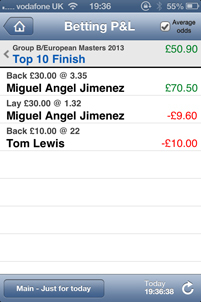 This decision making paid off and meant that (along with my £30 stake on Jiminez to notch up a top-ten finish in an event that he too has won before), I ended the weekend £220 up. 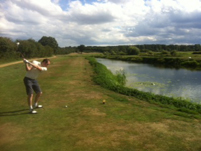 I realised, first-hand, what these pro-golfers have to go through to help make me money each week, and it’s not easy. I tried, I failed, but I learnt. My pick for the KLM Open this weekend is Brooks Koepka, who is only 23, has form figures of 28-18-7 going into the event following on from his debut appearances in the Open and the USPGA, and who has thrice emerged victorious on the second-tier Challenge Tour so far this term. Koepka is 33/1 on Betfair, 30/1 with Stan James and has the game to show he’s more than just an extra on the Euopean Tour stage.